BLAEU - Andalusia continens Sevillam et Cordubam. BLAEU, W. - Andalusia continens Sevillam et Cordubam. Andalusia continens Sevillam et Cordubam. 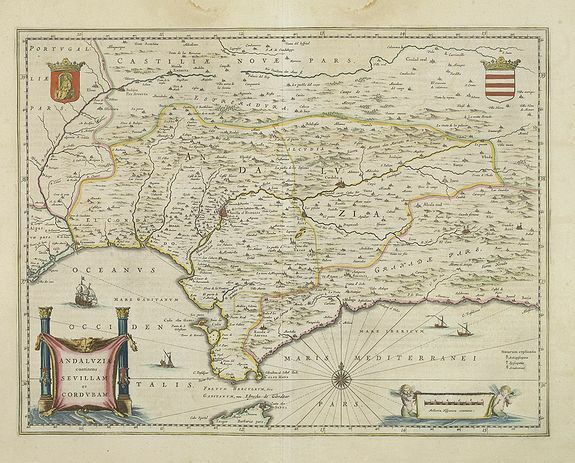 - BLAEU, W.
Title : Andalusia continens Sevillam et Cordubam.. Description :Features the province of Andalusia and the city of Seville, but also depicts the Straights of Gibraltar, know in classical times as the Pillars of Hercules. The title cartouche alludes to this by showing a lion skin. With two fine title and scale cartouches. Condition : Paper slightly age-toned. Some light water stains upper margin not affecting engraved area. Good and dark impression, wide margins. Else good condition.